I'm not a fan of pecan pie. It is one of the few deserts I can easily say "NO" to. 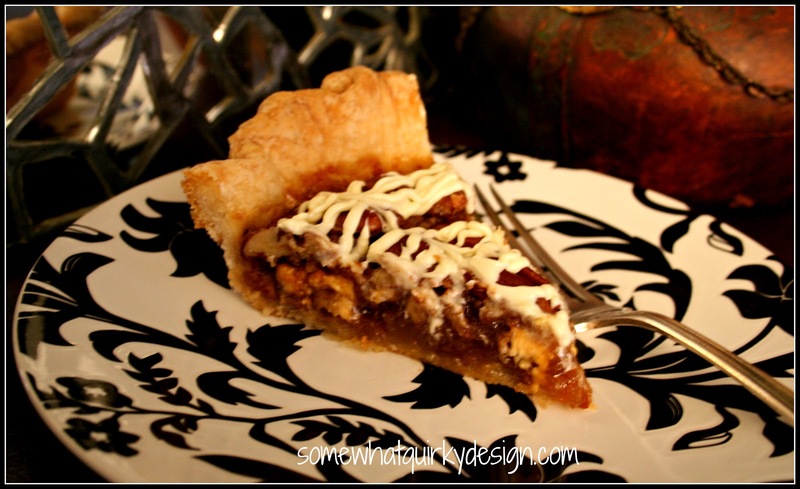 So I don't even know why I ever made this White Chocolate Pecan Pie. Probably because I love white chocolate. A lot. And I love pecans. A lot. So I tried it. Oh my. I'm glad I did! This pie tastes amazing. It doesn't have that syrupy sweetness that regular pecan pie has. Adding the white chocolate and toasting the pecans really rounds out the flavor. Try it you'll like it. I found this recipe in a Christmas With Southern Living book. Maybe in 2000? Pie Crust - either one you make or the refrigerated kind. Spread chopped pecans on cookie sheet and toast for 5-7 minutes while the oven heats up. Flour crust and place floured side down into a 9 inch pie plate. Fold edges under and flute. Bake at 450 for 5 minutes. Combine butter, sugar, and corn syrup in a medium sauce pan; cook over low heat, stirring constantly until sugar dissolves. Let cool slightly. Add chopped pecans and next 3 ingredients; stir well. Pour filling into pre-baked pie crust; sprinkle with two-thirds of chopped white chocolate. Top with pecan halves - I always place them side by sid in circles all the way to the center. Bake @ 325 for 50 to 55 minutes or until set. Cover with aluminum foil during last 10 minutes of baking to prevent excessive browning (just lay it over the pie). Let cool on a wire rack. Place remaining chopped white chocolate in a small heavy-duty zip-top plastic bag; seal bag. Submerge bag in hot water until chocolate melts. I usually put the bag in the water in the microwave for a minute or so. Remove bag from the water. Snip a tiny hole in one corner of the bag. Drizzle white chocolate over the pie. It's just yummy. And easy. By the way, I'm no pastry expert, but most of my crusts look a little better than this. The butter crust recipe that I use slides down the edge of the pan during the pre-bake - and I used a pan that was too deep. Thus the truly ugly crust. The pictures are from the BEST looking part of the crust! My pride wouldn't let me take a picture of the whole pie. Silly me. Because my thunder thighs were looking a little thin, I'm pinning this. How on earth did I miss this? 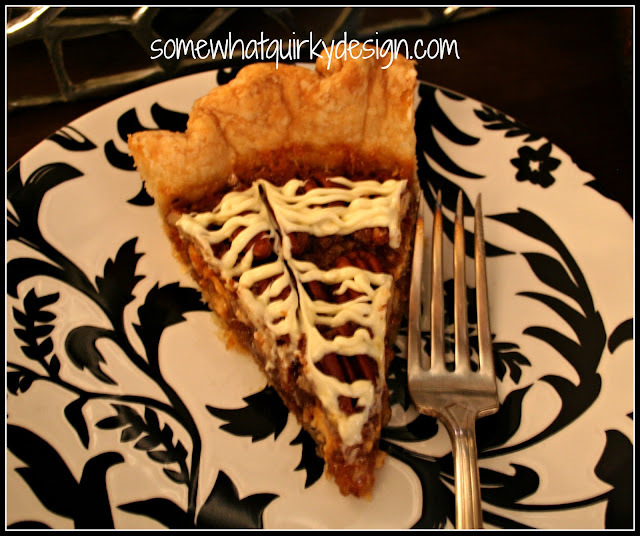 I love pecan pie and I love white chocolate, not to mention how pretty this looks with the chocolate drizzled over the top. I might have to take this to a get together this weekend.